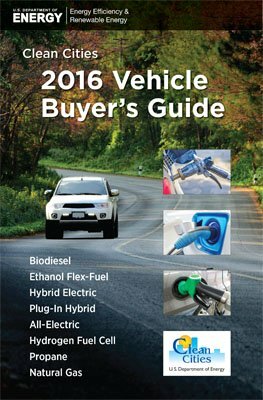 This helpful guide provides a comprehensive list of light-duty hybrid electric vehicles and vehicles that run on propane, compressed natural gas, electricity, E85, or biodiesel. The guide contains model-specific information on engine size, price, fuel economy, and emissions. It also provides short backgrounds on each fuel and helpful tips to improve fuel economy, compare and offset costs, and find alternative fueling stations. Download the Clean Cities 2016 Vehicles Buyer's Guide! In the 1990s and early 2000s, fuel economy decreased while vehicle weight increased. In recent years, however, light-duty vehicle manufacturers have employed advanced technologies to improve both performance and fuel economy. As a result, average fuel economy for all light-duty vehicles produced has improved nearly every year since 2004, and in 2018 rose to a record high of 25.4 miles per gallon. Despite a 128% increase in horsepower and 49% improvement in acceleration from model year 1980 to 2018, the overall fuel economy of light-duty vehicles improved 32% during that period. The data are based on production-weighted averages.